Butterfly Roost Site, just at Cleveland. Yes, Butterflies, too, fly across the Lake. “Their story is amazing; it’s heroic. You have this tiny insect that weighs less than half a gram that makes a monumental journey to a place that it’s never been. What’s not to love?” she said. From late August to mid-October, monarchs migrate south through Ontario, fly over the Great Lakes and land in a mountainous region of Mexico. It’s a 3,000-km journey. “They face a lot of hazards along their migration so it makes their journey even more remarkable,” Milam said. One of the biggest hazards is Lake Erie. The monarchs must make the trip across the water in one, non-stop flight. Anyone who agrees with this statement must also strongly oppose the construction of an industrial wind energy facility in the waters of Lake Erie. Lake Erie Energy Development Company (LEEDCo) has been proposing to do just that since 2011, and has now partnered with Fred Olsen, a wealthy wind developer from Norway. Their permit application to the Ohio Power Siting Board (OPSB) is currently pending action. 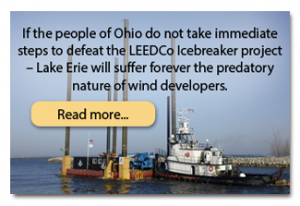 The project, called Icebreaker Wind Inc., has morphed from nonprofit to for-profit status and is touted as a “demonstration scale project to assess the potential success for future larger scale offshore wind farms in Lake Erie and the other Great Lakes”. 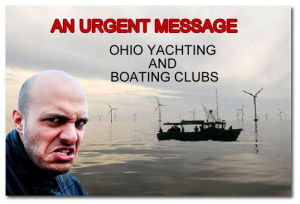 Yes, these 6 monstrous industrial wind turbines with a height of about 480 feet offshore of Cuyahoga County are intended to be the start of evolving the Great Lakes into a massive industrial wind power facility. For the sake of answering the question that is the title of this article, let’s set aside the human and other environmental costs of this horrific idea for now. “AVIAN SLAUGHTER: In its assessment submitted to the OPSB in response to the first Icebreaker proposal (then Case # 13-2033-El-BGN), the USFWS stated, “The waters around Cleveland provide important overwintering habitat for gulls (herring, ring-billed, Bonaparte’s, great black backed), ducks (greater and lesser scaup, red-breasted and common mergansers, goldeneye, bufflehead, redhead, canvasback), common loons and horned grebes. During winter, flocks of over 10,000 birds are not uncommon…” The document goes on to describe Icebreaker documents citing European offshore wind energy experience, but fails to mention that several European countries have banned offshore wind facilities from within 12 miles of the shoreline, suggesting this is likely due in part to the congregation of waterfowl nearer to that from shore! Even LEEDCo’s own environmental assessment reported that between 4-13% of migrants fly within the height of modern turbine rotors and that ten to hundreds of millions of birds migrate over Lake Erie! 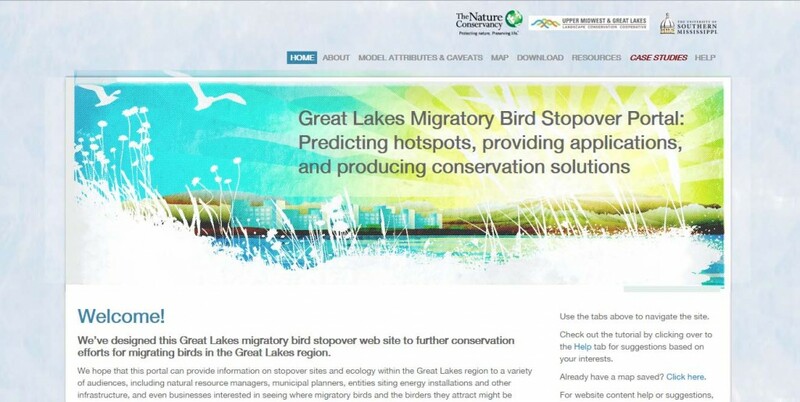 The USFWS states, “Based upon these numbers it would mean that between 400,000 to 13,000,000 songbirds fly at rotor swept height when flying over Lake Erie.” The Service also stated, based on radar studies of Lake Erie’s southern shore, that “vast numbers of birds and bats migrate along the shoreline and TRAVEL ACROSS THE LAKE.” And whether radar or other sophisticated studies, particularly those studies submitted by the wind industry, claim the Project area is not heavily used by migrants, it will not matter. Different avian species do not follow the same path every year. High and low air pressures, temperatures, wind speed and direction, all impact migratory routes. Where are five-year studies by LEEDCo that prove low numbers in the Project area? I don’t believe any exist. Even if they did, they would be much less valid than if done by an entity NOT paid by the wind developer. Even more troublesome, reporting of avian deaths by wind turbines are tracked and reported by the wind companies, not by government at any level, by independent contractors assigned by government or other neutral parties. It is commonly compared to “hiring the fox to guard the hen house.” Carcass counting is typically performed on a schedule, like 8 hours once every 30-60 days, and within a strictly defined parameter. In a Great Lake, it would be impossible to track, with carcasses being washed away or sinking. That is why the number of U.S. avian deaths by turbines vary between 585,000 per year (USFWS) with bats much higher at 800,000 per year, and somewhere between 13,000,000 and 31,000,000 (Spanish Ornithological Society). No one knows! The ODNR also responded, saying in regard to red-breasted mergansers, “Lake Erie is an extremely important staging area for this species, with huge numbers congregating in November and early December. Some observers have estimated as many as 250,000 red-breasted mergansers being seen from one spot in one day.” This was corroborated by Kathy Murphy of the Western Cuyahoga Audubon Society on their webpage on 2/11/2017. They are just one of the 350-400 species of birds, bats, and waterfowl found in, along the shoreline, and flying over Lake Erie. This is not new information! Back in March 2011, Jeff Schmidt, Chapter Director of the PA Sierra Club testified to the PA State Legislature regarding placement of IWTs in Lake Erie. He testified, “Lake Erie is unique among the Great Lakes because its shallow depth provides forage grounds for ducks, loons, horned grebes, and other waterfowl across its entire surface. Shorebirds, songbirds, and raptors all cross Lake Erie at varying altitude and locations. Migratory birds are already stressed…”. He goes on to state, “Lake Erie is unique in that its shallow depth provides potential habitat for pelagic birds across most of the lake’s surface. The USFWS and Ohio DNR recently completed a two year study with over 75,000 observations to map pelagic bird distribution and abundance in the Ohio waters of Lake Erie”. Be sure, once these IWTs are allowed to be built, there will be NO mitigation. How do you replace dead birds? It won’t matter. It is the responsibility of the wind developer to count and report dead birds. Seriously. An example of how that works is Wolfe Island, a small Canadian island at the eastern end of Lake Ontario. A relatively small project consisting of 86 turbines, 1,141 bird, 24 raptor, and 1,720 bat collision fatalities were reported during the first year alone! That does not include the carcasses that were blown into the lake, the injured birds that flew over the lake and then died, or the carcasses that were eaten by small mammals or vultures, or the flocks and individual numbers of geese, ducks, and other waterfowl that have been recorded flying into the turbine blades. The public outrage from this horrendous bloody, painful slaughter, leading the project to be referred to as the deadliest energy facility in Canada, resulted in new “management” procedures. This “management” is a revised counting strategy, consisting of counting carcasses in a small gravel area below the turbines and counting infrequently. This bogus counting and reporting by the wind industry has resulted in unrealistically low numbers of birds believed to be killed by IWTs, a fallacy that is accepted by our own government as well. I don’t need to multiply those deaths caused by 86 IWTs to what we can expect from a possible one thousand turbines that are the ultimate goal of LEEDCo and Fred Olsen of Norway. It wouldn’t matter anyway, as it is impossible to accurately count the deaths that would occur day and night in the middle of Lake Erie. “… harsh facts were condensed into a preliminary draft study of wind subsidies by researcher Teresa Platt, who circulated it to specialists for vetting. I obtained a copy of the extensively footnoted working draft, which gave chilling reality to the truth behind wind industry claims. ‘Every year since the 1980s,’ Platt’s study said, ‘the 5,000 turbines at NextEra’s Altamont Pass in California kill thousands of slow-reproducing red-tailed hawks, burrowing owls, kestrels, as well as iconic golden eagles, and bats.’ The birds Platt mentions are raptors – birds of prey – particularly valued for their agricultural role in killing mice and other crop-damaging rodents. Eagles, both golden eagles and bald eagles, have long impressed Americans for their majesty, and the bald eagle was selected by our Founding Fathers as our national emblem. Coupled with the thirty-year golden and bald eagle “take permits” authorized by President Obama, it appears that we have become desensitized to avian, including our cherished eagle, slaughter. Is Lake Erie destined to become the next Altamont Pass? Enough data. Look to the sky. Embrace the innocence, the flight above the earth of these unsuspecting amazing creatures doing what they have done for 150 million years longer than we have inhabited the planet. Yet, we continue to degrade our environment in ways that these avian dwellers cannot understand or readily adapt to, if at all. We are a species consumed with our own needs, without adequate regard for the birds, bats, and millions of other species we share this space with. In fact, birds are more important to the health and balance of the ecosystem than we are, yet we slaughter them without conscience. 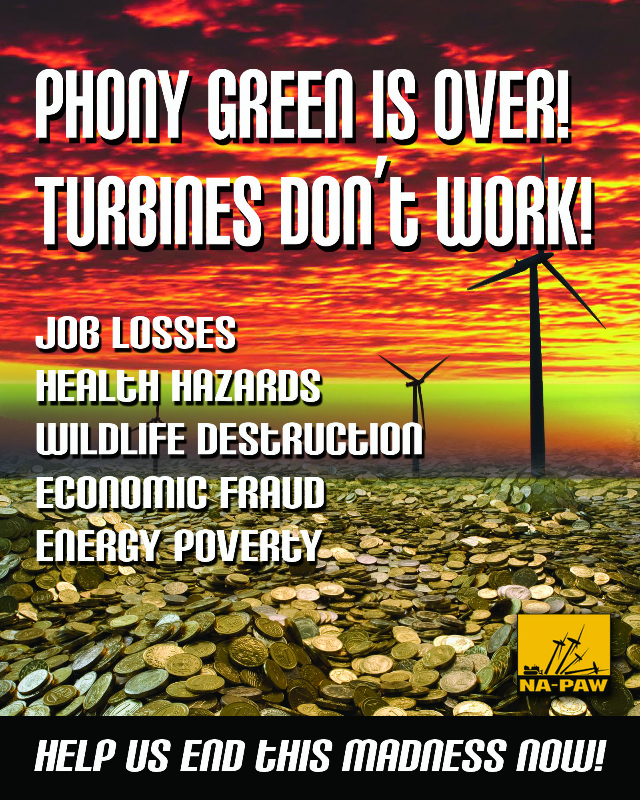 Is there a way to convince wind energy developers of this fact? For the past two decades, multiple organizations and individuals worldwide have tried, to little or no avail. One fact is glaringly clear. The survival of flying animals over Lake Erie, and ultimately all of the Great Lakes if the Icebreaker Wind, Inc. is allowed to be built, is in human hands. Our human hands. OPSB Case No. 13-2033-EL-BGN, LEEDCo Icebreaker project. Rebecca Horton, et al., “Great Lakes Avian Radar Technical Report, Lake Erie Shoreline: Erie County, Ohio and Erie County Pennsylvania, Spring 2012.” U.S. Department of Interior, Fish and Wildlife Service, Biological Technical Publication FWS/BTP-R3012-2016. Ron Arnold, Executive Vice President, Center for the Defense of Free Enterprise: Frontier Centre for Public Policy, May 28, 2013. Altamont Pass Wind Resource Area Bird Fatality Study, Bird Years 2005–2009. Testimony of Jeff Schmidt, Chapter Director, Sierra Club PA Chapter: Offshore Wind Energy in Pennsylvania, March 14, 2011. Jim Weigand, wildlife biologist, letter to the USDOE- 2016.